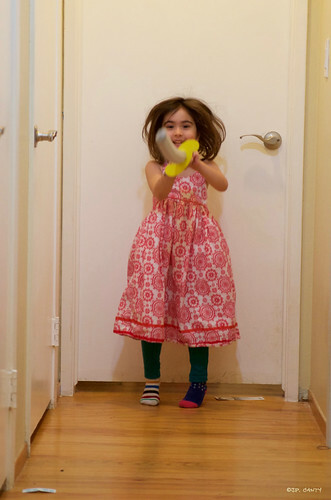 Better Than Yarn: En garde... UNAGI! Rosie is the one who thinks up great ideas like taking a Costco sized bag of toilet paper to the preschool and letting the kids toilet paper everything they can get their hands on. Rosie is the brainchild behind Sparkle Magic. 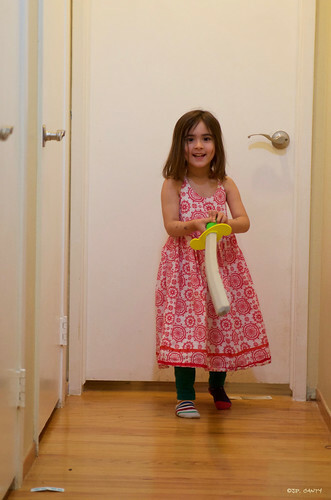 Now, don't confuse her with Fiona, because Fiona likes to have fun, but tidy, organized, Pinterest-worthy fun. Where Fiona is a photogenic poster child, Rosie is an eyes-crossed-tongue-out kind of gal. Rosie is the unbridled, belly laugh kind of fun. 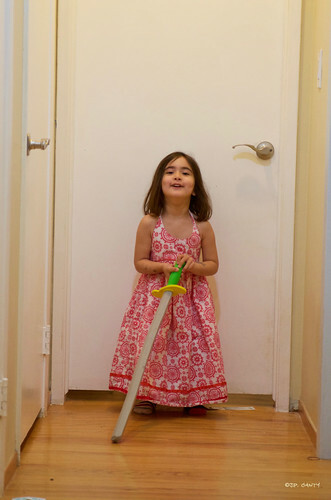 So when we went to the drugstore for the necessary stuff, and came across foam swords, it was no real surprise that Rosie piped up. 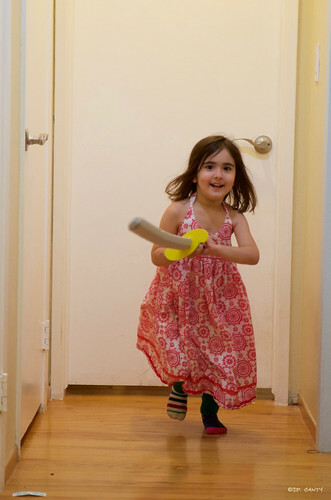 "FOAM SWORDS!" Rosie was ecstatic, "Can you believe it?! These are awesome!" "These are a terrible idea. Someone is going to get hurt. Things are going to get broken," I countered. "They're FOAM. Come on, live a little," she encouraged. "It'll be FUN." I gave in, and two swords became ours. 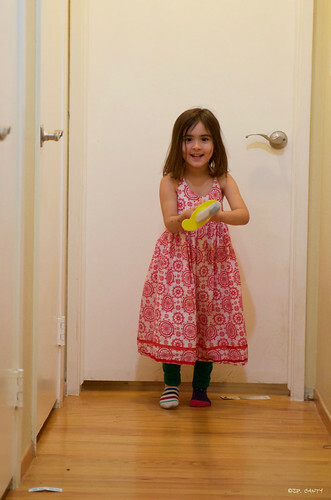 Genevieve couldn't WAIT to play with them, so we each took turns. We had just watched the first half (roughly) of The Princess Bride (turning it off after - SPOILER ALERT - Wesley gets killed in the dungeon, because that part scared Genevieve.) so naturally, Genevieve was Buttercup. I played the Man in Black, using all of my swordfighting skills- all obtained from watching the aforementioned Princess Bride. 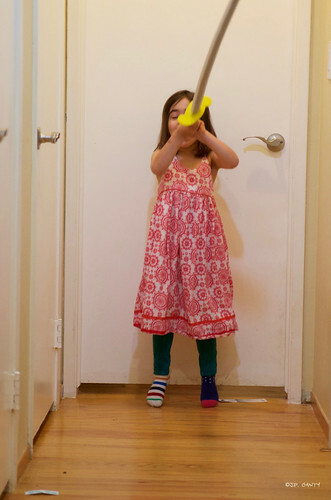 I don't quite know which character Andrew was, but my mother - in her purest form - observed classic swordfighting etiquette. 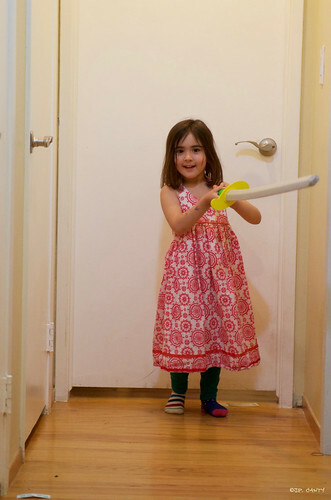 From the hallway (the best place in our house for a duel, really), I heard my mother declare, "En garde!" "UNAGI!" 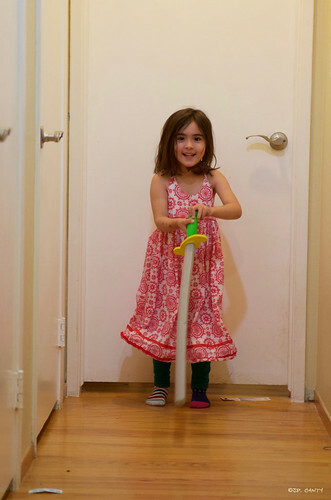 Genevieve yelled, running towards Mom, wielding her sword like an axe. Now, there was no question as to what she yelled, because it was as clear as a bell. Once I picked myself up off of the floor (and stopped laughing like a demented hyena), Andrew turned to me and simply asked, "Unagi?" You know the bit with the shrieking eels? Genevieve likes to do big body play after naptime with me, and the day after watching The Princess Bride, she wanted to play "shrieking eels". She, predictably, was the shrieking eel, leaving me to play the role of Buttercup. I don't know if you've noticed, but I'm not exactly the "damsel in distress" type. So, I turned the game on it's head - a bit - and said, "Eel? I love eating eel... as UNAGI!" and then wrestled, and nibbled on the eel- who then shrieked with good reason. 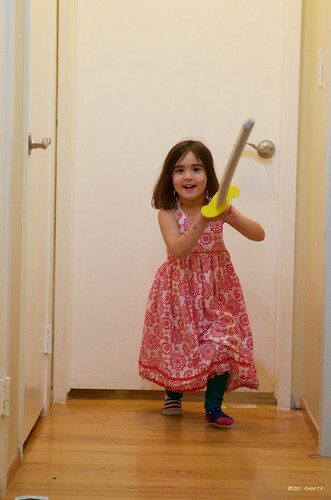 Since only two of us can play at a time, I have been researching getting more foam weaponry (specifically these, though they're shorter than the swords) because you know the saying. "The family that mêlées together, stays together."